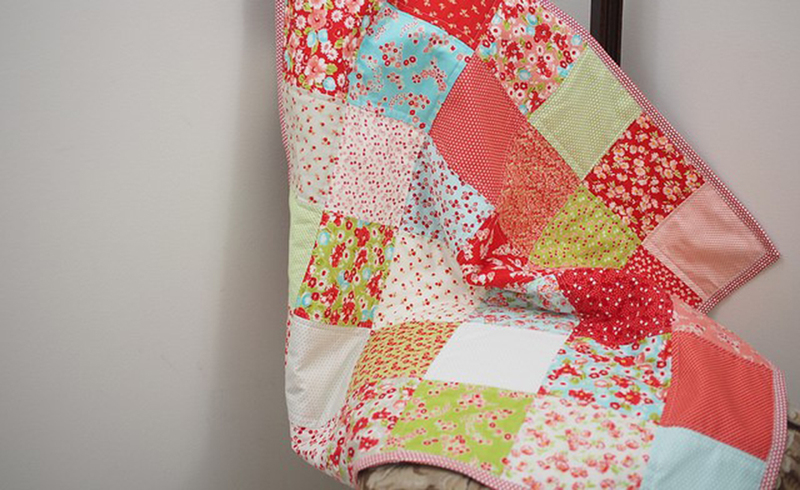 If you can sew then you can quilt. It’s a wonderful hobby once you know how to do it. There are just a number of steps in order to complete a quilt but the good news is that you can learn quickly. 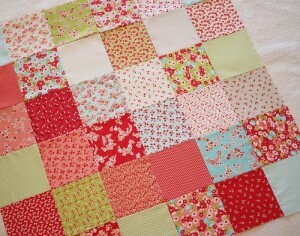 I’ve put together an easy patchwork quilt project using pre-cut squares (called charm squares). In this project you will learn how to assemble your quilt top, sandwich it all together, quilt it and then bind it to finish it all off. 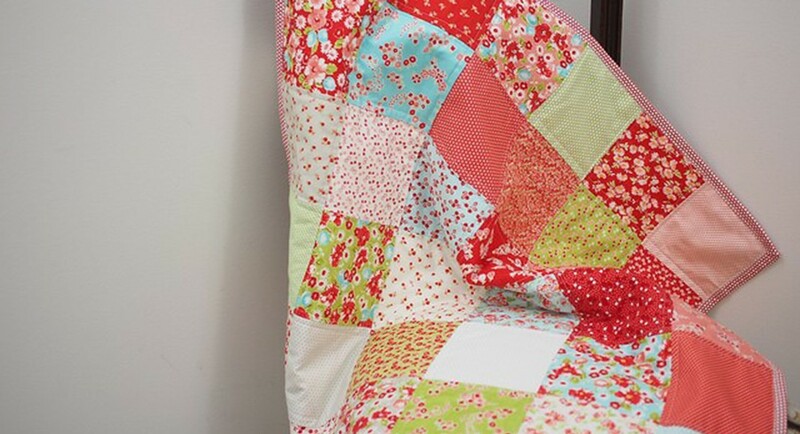 We have used 1 charm square pack and the finished quilt is a nice size for bassinettes, prams, and arms of couches/lounges, backs of chairs or as a small gift. 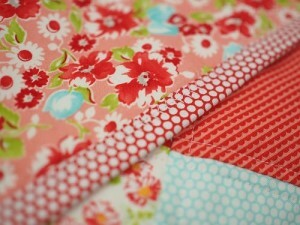 2 charm square packs make a nice size for a cot, over the back of a 2 seater lounge or as a lap quilt. You can also add a border to the finished quilt top to make it larger but to keep this project as simple as possible we have left off the border. 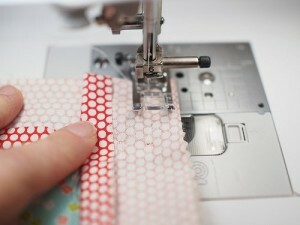 Quilting uses a ¼ inch seam allowance which is narrower than what you would use for your sewing projects. 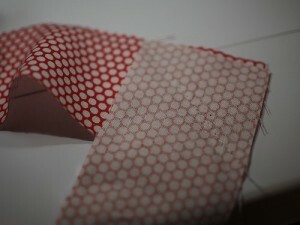 It’s important to keep this same ¼ inch seam throughout your project so that your points match up and your work is neat. 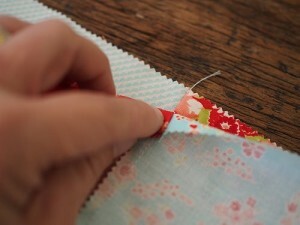 If you would prefer to use a ½ inch seam then just remember to use it throughout the project. 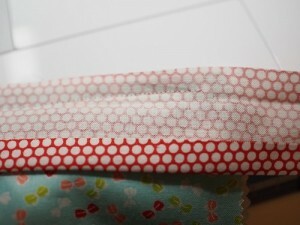 If you don’t have a ¼ inch foot for your sewing machine then you could lay a piece of sticky/washi tape that is ¼ inch from your needle centre position and use that edge of the tape as the guide for the edge of your fabric. When it comes to pressing seams everyone has their own method. I was taught to press mine to one side and then the next row has the seams pressed the other way. 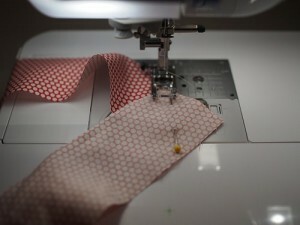 If you have a light and a dark fabric joined together then press the seam to the darker side of the fabric. Just try to be consistent within the one project with whatever method you choose. Don’t have your iron set too high as you press your seams. Make YouTube your friend. Just search the step you are trying to complete and there will be a video there to help you out. 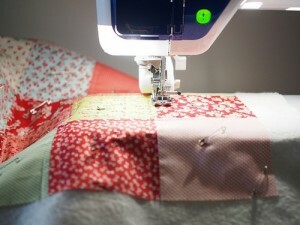 I like to quilt my quilts using free motion quilting. 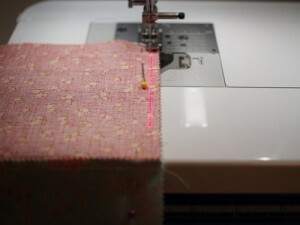 For this method you lower the feed dogs on your sewing machine and move the fabric with your hands. To keep this project simple and suitable for all beginners we have quilted straight lines using a walking foot. I actually find straight lines a bit trickier but thanks to the dual feed foot on my Brother it was easier than I expected. I do recommend drawing your lines for accuracy using a water soluble pen. 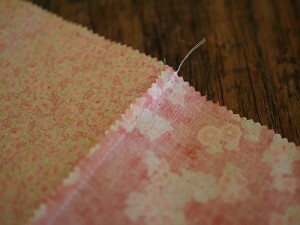 You could hand quilt your quilt using perle cotton and a quilting needle. It is a very relaxing project and does take longer. 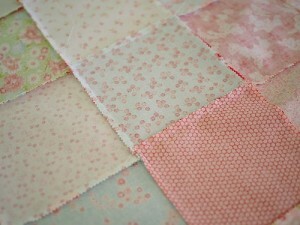 Lay the charm squares out into an arrangement that you like for the quilt top. For this project I used 6 squares across by 6 squares down and had a few squares leftover. You might like to use all of your squares or less. It’s up to you. 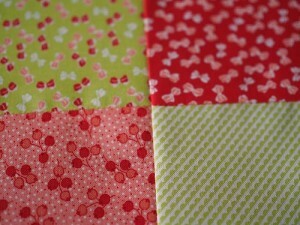 You can also use 2 charm square packs for a quilt that is perfect to snuggle under or throw over a lounge. 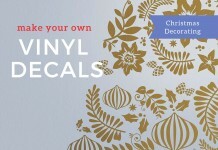 You might like rows of the same colour or design or just go for a scattered look. Take care not to have 2 of the same fabrics next to each other. I like to take a photo on my phone and look at it to make sure it looks good. We are going to join our squares together. First we are going to go down the first row taking our first square and the one underneath it. We are going to join the bottom of the first square to the top of the square underneath and I like to pin where I am going to sew and then take to my sewing machine. 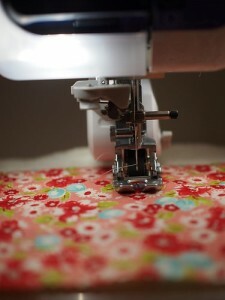 Have your needle in the needle centre position (stitch 3 on my machine/a Brother machine) and with your ¼ inch foot on your machine (or tape marking the ¼ inch mark) you are going to sew the 2 squares together. 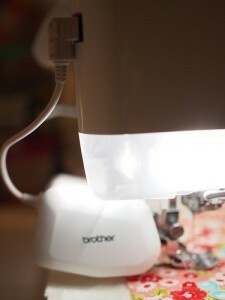 My Brother DreamWeaver comes with a Sew Straight Laser Vision Guide that helps me stay on track with my ¼ inch seam and it’s very handy for quilting and neat seams. Open the squares out and take the 3rd square in the first row and sew it to the bottom of the 2nd square with right sides together. Keep doing this until you have finished your first row. I like to put it back in the place I had it on my table and start on the 2nd Repeat for all rows and you will have 6 or so rows of squares all stitched up. At the iron we are going to press our seams. I like to press the seams on the first row all facing down. Then on the 2nd row I like to press them up towards me. On the 3rd row I will press them down and I repeat this so that one row is going up and the next is going down. The reason for this is so that when you sew the rows together you won’t have all your seams on one side. 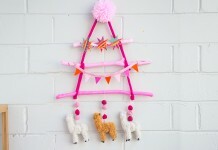 Now we are going to join our rows together and I like to work left to right. Take the first row and the 2nd row and place them right sides together. Pin down the long side where the 2 rows meet and taking care that the joins between your squares one row join the squares on the other row. This ensures that you will have nice neat points on your quilt. But as you are starting out don’t expect this to always be the case. I like to nestle the joins into each other so that they match perfectly. There are 2 ways to pin. Some people like to sew over their pins and this will give you the most accurate result and just make sure that the head of the pin is not near the needle on your machine. I prefer to pin to the left of where I am going to sew. Sew from the top of the row to the bottom, take your time and remember to use a ¼ inch seam or whatever seam allowance you have decided for the project but please just be consistent or it won’t turn out accurately. 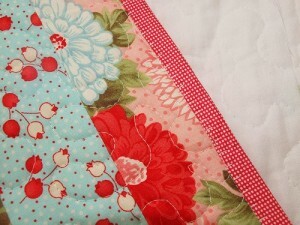 The ¼ inch seam might take a bit of getting used to but will have you quilting perfectly in no time. 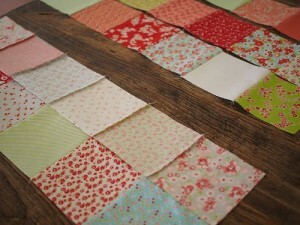 Repeat this by adding the next row to the rows you have completed until you have sewn your quilt top together. Now take to the iron and press the seams. Don’t have your iron too hot and I like to press one seam to one side and the next seam is pressed the to the other side and keep working that way across the quilt top. I also like to iron the wrong side of the quilt first and then flip it over and iron the right side gently to finish it off. Iron your backing fabric and lay it right side down on a clean large surface like a table or floor. The backing fabric should be a few inches wider than your quilt top in all directions to give you some room to lay your quilt top on top of it and not have part of your quilt without backing fabric. 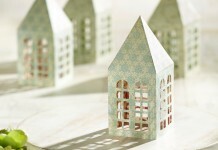 Smooth out any wrinkles or air and tape the edges of the fabric to the table or floor. 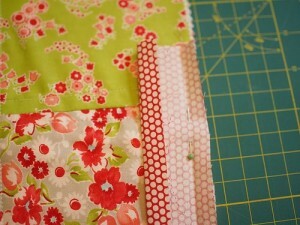 Cut the quilt batting to the size of your backing fabric and lay on top of your backing fabric. Smooth out any wrinkles. Now lay your quilt top right side up on top of the batting. This is called making your quilt sandwich – you have the backing fabric face down, the quilt batting in the middle and the quilt top on the top of the pile. 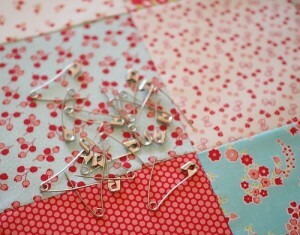 We are going to pin using the quilt safety pins to attach all 3 layers together and keep them that way. How many pins you use is up to you. 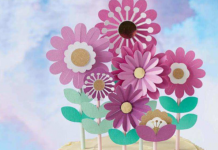 You might like to use a few pins within each square or a pin per few inches. For larger quilts I would have more quilt pins per square. You can also use regular sewing pins but just be careful that you don’t hurt yourself when you are at the sewing machine. 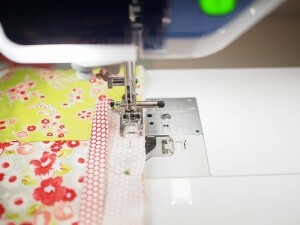 The idea with the safety pins is that you can machine quilt your quilt safely and remove the pins as you go. However I kept the pins in the centres of the square and a few on the edge of the quilt and didn’t remove until after I finished sewing. Place your walking foot on your sewing machine as per instructions. My Brother DreamWeaver has a dual feed foot which plugs into the back of the machine and is larger than the usual Brother walking foot. It is also quieter and works beautifully. 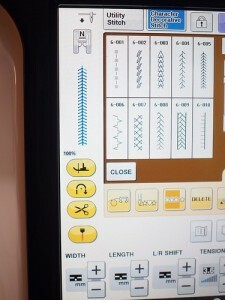 You can also easily adjust the tension with a press of the button on the machine screen. If you have some scraps of fabric and batting run a piece of batting with a large-ish piece of scrap fabric on top through your walking foot on the machine and check that the stitches are even on the top and bottom of your work. Sometimes you need to fiddle around with the stitch length but if you have a Brother machine with auto tension this isn’t usually a problem as it will adjust it for you. 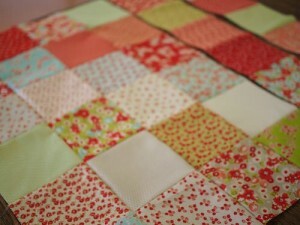 Now I recommend drawing lines either side of your seams going across the quilt and then going down the quilt. You might like lines about ½ inch either side of your seams. This creates a nice grid and is much easier than ‘stitching in the ditch’ which you might have heard of it but is actually quite a tricky technique. 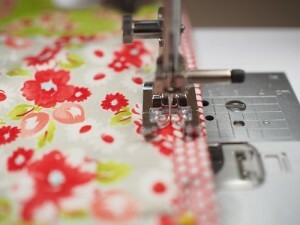 Alternatively you can use your machine foot and the quilt seams as a guide for your straight lines. I start from the middle row and work to the right, then the middle to the left then I work from the middle out in one way and the middle out to the other until the whole quilt is quilted. Check as you go that you don’t have any puckers. Sometimes when you are starting out you might have a loose bit of fabric that folds over on itself and then you sew over it creating a pucker on the back. SO checking as you go means you can unpick that row and do it again. 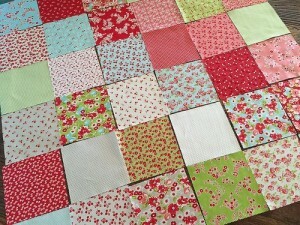 Now cut off the excess batting and backing fabric using your quilt top as a guide. 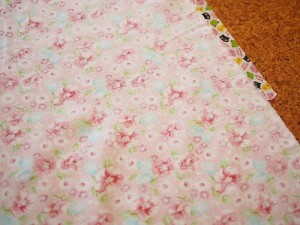 Don’t cut into the quilt top as you want those nice straight lines to match up with your binding when we finish it all. Admire your work because you are almost there. 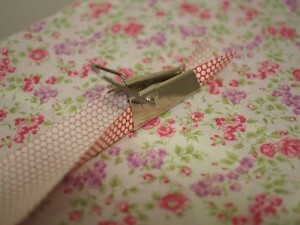 To make the binding iron your fabric and remove selvages. 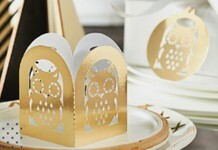 With a ruler and a pen mark lines that are 2 inches wide and cut with fabric scissors (if you don’t have a rotary cutter and mat) or just cut using a ruler and rotary cutter. I like to do mine horizontally across my fabric. Other people like to do theirs on the bias. It’s up to you. 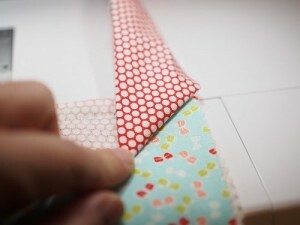 You will need at least 3 or 4 strips of fabric. 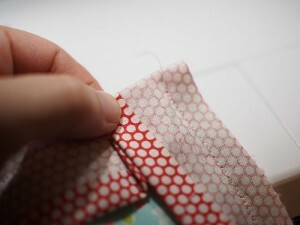 Take 2 strips and place on top of each other with right sides together to create a right angle, sew a straight line from one corner to the other as shown in the picture and trim edges. 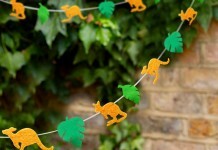 Some people like to draw a line but I just prefer to sew them. Take another strip of fabric and join it to the end of the 2 you just sewed together and keep going until all of your strips are joined together. You will have one long strip of fabric. I like to trim most of the excess on the wrong side of the joins. Leave about ½ inch. Now with a bias binding maker feed the strip through the maker and iron the binding well as it comes out. Be careful not to iron your fingers and even the heat from the iron can get a little hot so be careful. I have no idea why I quilt because I’m not a fan of ironing. Once you’ve finished I like to flip the binding over and press the other side well from one end to the other. If you don’t have a bias binding maker then fold over your strip horizontally ironing as you go for the whole length of the strip. Open it out and press the edges of the fabric into the centre line (wrong sides of the fabric are matching) and press the entire length of the strip. 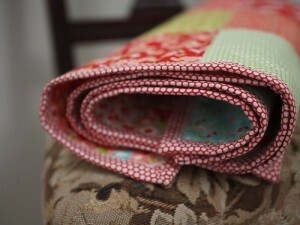 Now we are going to pin the binding to the quilt. 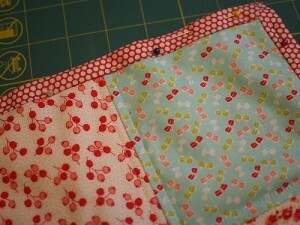 To do this I open out the binding at one end and pin the opened out edge to the middle of the bottom edge of my quilt. Pin through all layers. Matching raw edges. 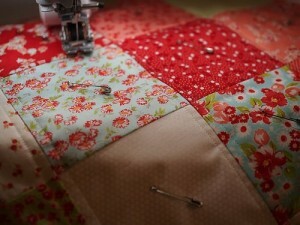 Keep pinning until you reach the first corner of your quilt. 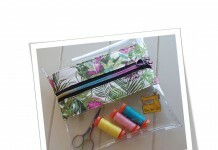 Using your regular sewing foot, walking foot or dual feed foot you are going to sew along that crease in your binding. 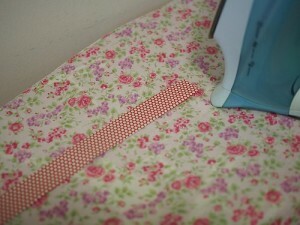 I like to leave a few cm’s at the start of the binding and sew until a few mm’s from the corner. It’s important not to sew right to the end of the quilt because we are going to do a mitered corner before we can sew the binding to the next side of the quilt. Now we are going to do a mitered corner. This might take a bit of getting used to but if you start off doing it the right way you will always get better. 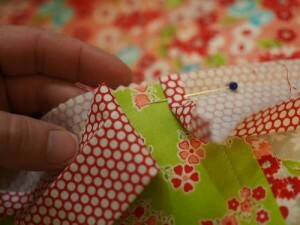 Lift the binding up and press back over the end of the binding that you have just sewn to your quilt. You will have created a fold in the corner and just press with your finger. Now bring the binding down carefully keeping that corner fold in place and the binding raw edge matches the raw edge of the quilt just like you did for the first side that you sewed. Pin the binding down carefully for the entire side of the quilt. If we looked underneath our corner it would look like this. The reason we do this is so that when we fold it over to the other side to attach the other side of the binding we will have neat corners on the front of our quilt. Now we are going to sew this side of the quilt. 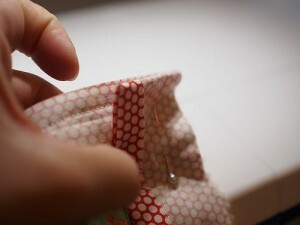 I like to start sewing a few mm’s from the top of the quilt and keep going using the crease of the binding as our guide. Sew from the top to the bottom remembering to stop a few mm’s from the bottom so that we can do another mitered corner. Oh yes, you need to do 4 corners all up and we only pin one side and sew until we get to the next corner. Repeat using the instructions for the mitered corner. It is the same for each side until we get close to our starting position. 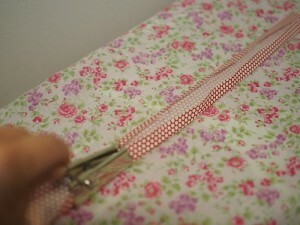 If you turn over your binding to the other side it will look like this. When you have done your 4th corner you will see we need to somehow create a neat finish for our binding. 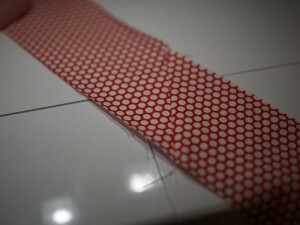 What I like to do is trim the binding a few inches longer than I need to cover my starting position. On the starting position binding fold back a few mm’s and press with your fingers. 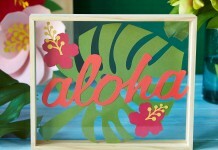 You can create this on an angle or just as a straight edge. It’s up to you. Then we are going to lay the binding ending inside the starting position. We will sew right over the creases so make sure that they line up. Now we are going to fold the binding over to the other side of the quilt and attach it. There are a few ways to do this. 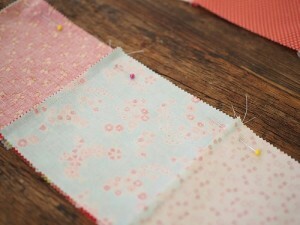 When I have the time I like to hand stitch my binding as it gives me greater control over the back of the quilt. 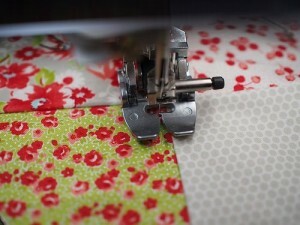 Machine stitching your binding to the back of your quilt is the fastest way to finish your quilt but it can be tricky to catch all of the bindings at the back of the quilt because you are stitching on the top of the quilt where you want the best result. 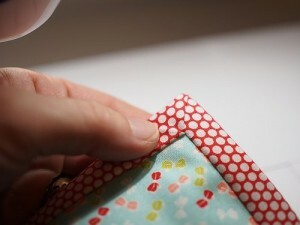 I usually use a blanket stitch on my machine which is a great stitch for adding binding. 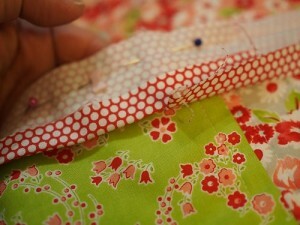 Here is an example of machine blanket stitch used on quilt binding. But for this project, I decided to use a different stitch (6-005 on my Brother DreamWeaver) which worked out beautifully and it’s actually a great way to use the decorative stitches on your machine. So have a little play around and see which stitches you like being careful to use one that will also be catching your binding edge on the back of the quilt. Take your time. 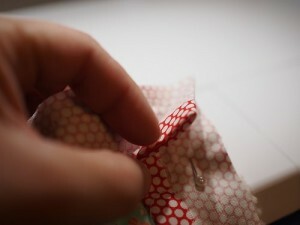 I like to pin and do one side, fold the mitred corners over carefully and sew them and then do the next side. You will want the centre of your decorative stitch to be ‘in the ditch’ or in the join that is between the binding and the quilt. 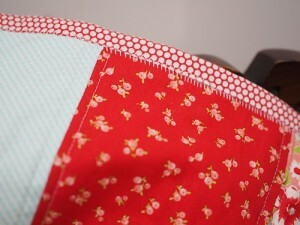 You want to sew with the right side of the quilt facing up because that is the quilt front and you also want the back to look nice and be catching the binding. And therein lies the trick to machine sewing the binding on. Trim all of your threads and check that when you turn over the quilt you have secured the binding to the quilt at all points on the back of the quilt. If there is a little bit that hasn’t been stitch properly then I do a little bit of hand sewing to secure it neatly to the quilt with some tiny stitches that you can’t see. And now you are finished! I hope you enjoyed the project and just remember that quilting is something that takes time but is well worth the effort to learn the steps and make something beautiful. You will get better with each project that you make and it’s a wonderful hobby and a great way to use up your fabric stash.